Join alderman Reilly at the Next Club 42! When: Thursday, February 21, 2019 • 5:30 p.m. - 7:00 p.m.
Club 42 is a quarterly professional networking event in downtown Chicago's 42nd Ward created by Alderman Brendan Reilly in 2008. The purpose is to encourage downtown professionals to become politically engaged in the ward and local politics. 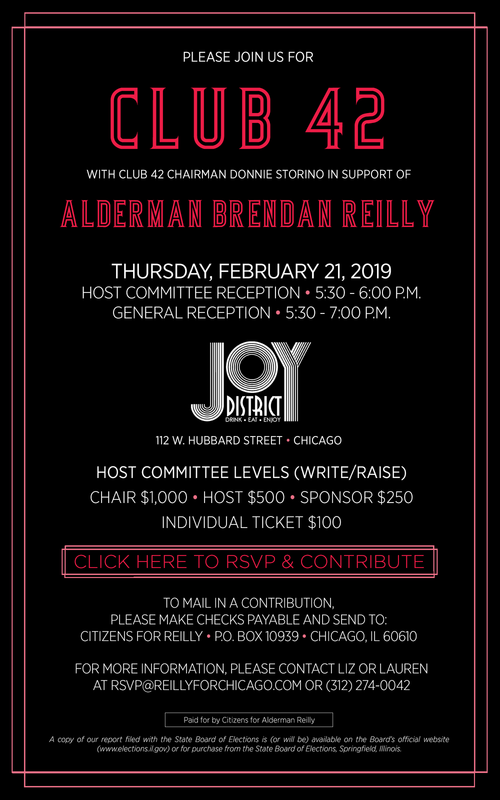 If you are interested in becoming involved with Club 42, please email us at RSVP@ReillyforChicago.com.